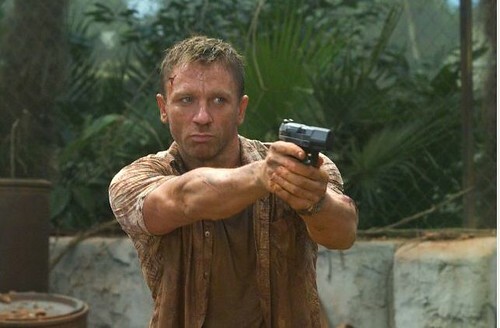 Casino Royale is a Bond fan’s dream after questionable direction with the Brosnan series. Bond was grittier and darker. He bleeds, emotes, and has to deal with an irritating boss. The influence of the Jason Bourne trilogy could not have been more noticeable for this reboot of James Bond. A comparison of the two film series was an inevitable thought to a Bond fan such as myself. In this article, I shall leave out discussing the cinematic merits of the films and instead discuss the political messages sent out by these two series. The Bourne movies have without a doubt followed a long tradition of movies pitting one man against evil government forces, a recurring theme throughout American (especially espionage) films. They hearken back to the idea that Westerns had put before them of one man fighting a more moneyed and powerful oppressor. Jason Bourne begins the trilogy with no memory of who he is and what he has done. Rather than plead amnesia to his former bosses, they do little more than assume he’s gone rogue and dispatch someone else to kill him. The movie slowly unravels a plot exposing government as evil and capable of breaking any law in pursuit of its own power. That leaves the individual (Jason Bourne) with nothing more than his wits and skill to bring to justice the evil men who not only threaten the world, but their own country. Government is bad. On the other hand, we have James Bond. MI6 has had its fair share of traitors (no spoilers here) but never the pernicious betrayals from its top leaders. The CIA is apparently stocked with a hierarchy with nothing better to do than to impose a shadow fascist government on its own people. MI6 is always portrayed as a force for good in a world that is constantly threatened. It’s almost reminiscent of the White Man’s Burden. James Bond is called in on behalf of MI6 to save the world from ruthless drug lords, the Soviets, and foreign terrorists. He never gets thanked properly and quietly carries this burden alone. He is above common morality and law. James Bond dispenses justice with one thing and one thing only: his license to kill. Government is good.